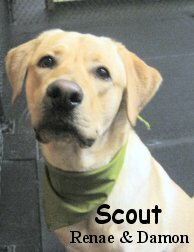 Fort Fido Dog Daycare & Boarding News Blog: Stunning Scout! Scout is a handsome one-year-old Yellow Lab who came in for his assessment this morning. He played well with the other dogs, and was a big feature on the clips of the day! Here is the best one, where he plays with Golden Retriever Buddy and a Yellow Lab named Maximus. You can also spot Stella the Boxer running to get in on the action.